Philadelphia, Pa. 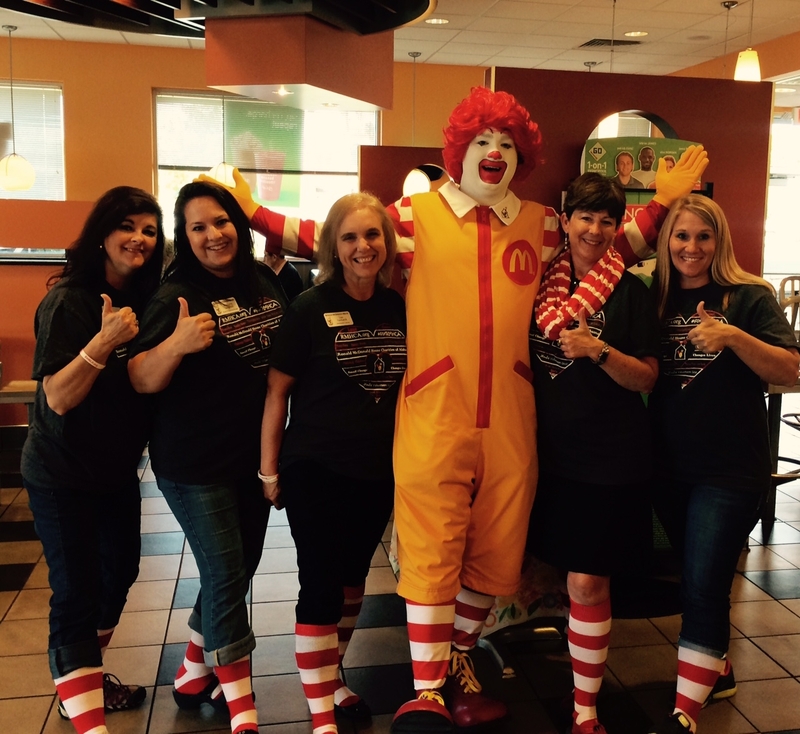 This event coincided with Day of Change which brought supporters to McDonald’s to drop their spare change in the RMHC donation boxes. It all started with one: one child who needed health care, one family who hoped to stay nearby and one community who came together to build the first Ronald McDonald House. Kim Hill, a little girl who battled leukemia, was that one child who inspired the RMHC system. Her mother, Fran Hill and her father, former NFL Philadelphia Eagle’s player Fred Hill, slept on hospital chairs and ate from vending machines to stay by her side. The hill family’s struggle to remain close to their daughter while receiving treatment inspired one doctor, one football team, one community and one company, McDonald’s, to create and build the first Ronald McDonald House in Philadelphia in 1974. From the moment the doors opened on the first Ronald McDonald House in Philadelphia, Pennsylvania, 40 years ago, the McDonald’s System (Owner/Operators, Suppliers, Employees and Customers) has been proud to call this mission their own. In fact, proceeds from a Shamrock Shake fundraiser, helped raise money for the building of the first Ronald McDonald House in 1974. In the 40 years since, McDonald’s has contributed unwavering support—including monetary contributions, volunteerism, board participation and media donations–all of which have helped impact countless lives by giving children support, stability and the best medicine of all–their families. In 2013, our community donated $155,000 to Ronald McDonald House Charities of Alabama by donating their spare pennies, nickels, dimes and quarters in the RMHC donation box at their local McDonald’s. Thank you for your continued support with our largest fundraiser. 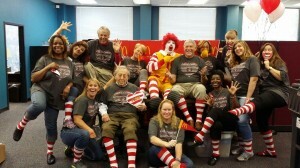 We loved seeing everyone sharing their red & white stripes #forRMHC! We still have socks available if you are interested in sporting them around town or while you run our Red Shoe Run on January 10th. Contact us at RMHCA 205-638-7261. Click on the links below to check out some of the media clips featured on the Day of Change. Small Change, Changes Lives!